Ginger root really packs a punch – both taste-wise and health-wise! Ginger is very good for sore throats and stomach upsets. If you have got a sore throat, try simmering six slices of ginger with 3 black peppercorns for five minutes. Pour through a sieve into a cup and add a pinch of baking powder (helps to soothe a sore throat), juice of half a lemon and a teaspoon of raw honey. I also make tea with fresh ginger root by adding slices of fresh ginger to simmering water together with some mint leaves. I leave it to simmer for five minutes before sieving off the sliced ginger and mint and serve the tea with a squeeze of lemon juice and some raw honey. I love it! Another tasty way to make ginger tea is to simmer sliced ginger with a cinnamon stick for 5 minutes. Again, you can add some lemon juice and honey for taste. Ginger- as well as turmeric, another spice which is frequently used in Indian food – are natural painkillers. Both help to reduce the over-production of leukotrienes that cause pain and inflammation. It is definitely worth eating a lot of ginger and adding turmeric spice (a1/4 teaspoon per day is enough) to your food if you have arthritis. I cook a lot of Asian-style food and use ginger in all of these dishes. The hot and spicy flavour of ginger is perfect for this type of food. 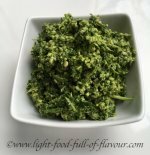 It is great to use for both marinades and different curries. 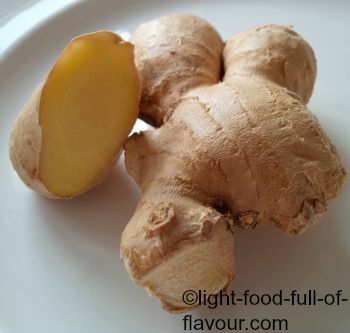 An easy way to use fresh ginger is to add it to a marinade which you can use on vegetables, fish or chicken. I am going to give you two examples of delicious marinades. Mix all the ingredients together and divide over 4 salmon or trout fillets. Heat the oven to 200C/fan180C/400F/gas mark 6. Once the oven is hot, cook the fish in the oven for about 10 minutes. Place all the ingredients for the marinade in a blender and blend until everything is well combined.